Clyde Arc, a photo by Gordon McKinlay on Flickr. It’s not been the best week to get a new lens The rain hasn’t really stopped all week. It has been grey and dismal every day. There has even been some difficulty in discerning the difference between day and night at some points! As I am sitting writing this the daylight appears to be trying its hardest with little effect. Hence the reason I have not been posting lots of photos taken with my new Sigma 120-400mm lens. This is a lovely piece of kit. I will just have to be patient and use it when the light is better. This shot was taken to show the zoom range of the lens. The light was very poor so I had to set the ISO at 3200, hence the picture is a bit grainy. It needed to be this high in order to allow me to have a fast enough shutter speed to get away without using a tripod. I am sure there will be plenty of sunny days ahead when I can bore everyone to tears with pictures taken with my new lens. 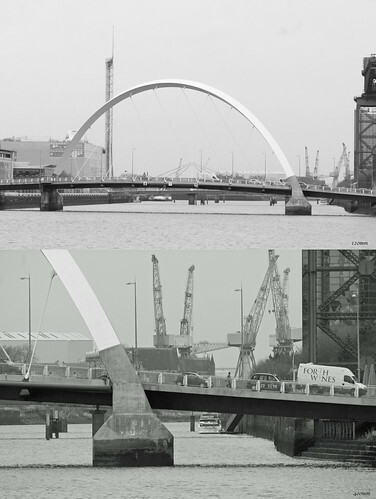 This entry was posted in Professional and tagged Arc, B andW, Black and White, Clyde, D300S, Glasgow, nikon, sigma, Squinty Bridge, zoom on 22 December, 2012 by Gordon McKinlay.